Black tile – does it work for you? Remodelista has an article today on black tile in bathrooms. It must be the weather (Fall is coming soon), because I was just thinking about dark bathrooms. It seems that most home remodels go for the light look – white, off-white and warm muted colors. I suspect that due to our long dark winters in the Pacific Northwest, we tend to choose light and warm colors. But there is room for variety! There are those out there who go for the dark look. It can have a glamorous look. Check out some of the pictures and see if it could work for you. Consider making a radical change for your next bath remodel! Any remodeling project has an almost endless list of things to consider, from the all-important budget to the colors and style you want. In a bathroom, the part of the remodel that is outclassed by the shower, tub, sink, faucet, lighting and flooring is . . . . wait for it . . . the walls! Will they be painted? Tiled? Especially in smaller bathrooms, the walls can have a huge impact on the impression the bathroom creates. The NKBA, or National Kitchen and Bath Association, has a nice article that can help with decisions on what to do with those walls. The paint, tile, and glass block options are discussed. So, get your inspiration together and get started! A good contractor can help with the details. Bathroom basics – turn a boring bath into an experience! There are endless websites with suggestions on how to improve or completely re-do your bathroom. It all comes down to two basics: your personal tastes and costs. I found a nice collection of bathroom remodeling ideas, with photos (a necessity), at http://www.abathroomguide.com/. I love the shower tile that can be a work of art in itself. 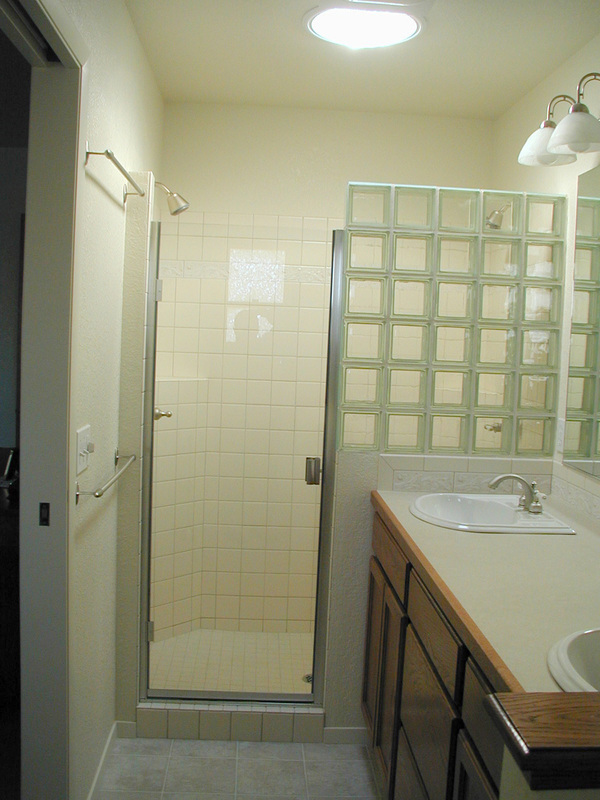 The addition of clear glass shower doors provides a look of luxury and shows off the beautiful tile pattern. The shower heads can be almost anything you can imagine. Bathroom remodels – be inspired! 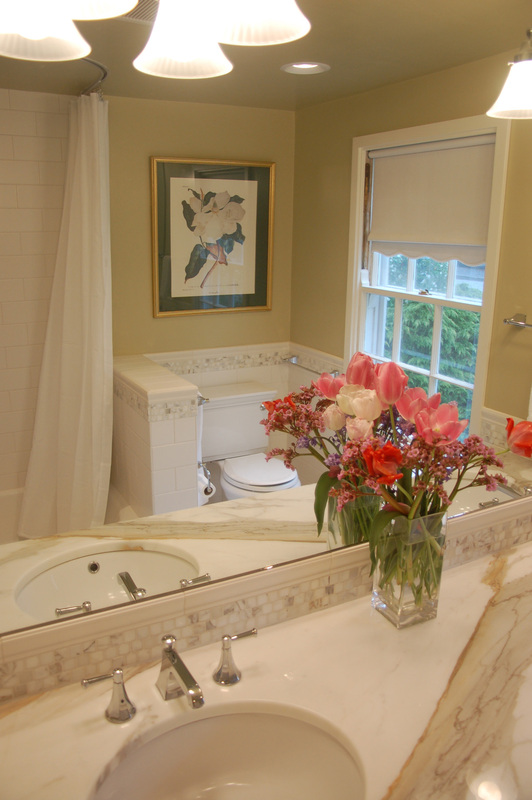 This is one of my favorite bathroom remodels that we have done. It has a very light and airy feel, with a luxurious note due to the beautiful two-tone solid surface countertop and tile work (look in the mirror reflection). Another view of this cozy bathroom, showing the beautiful cabinets that every bathroom should have! So, be inspired! 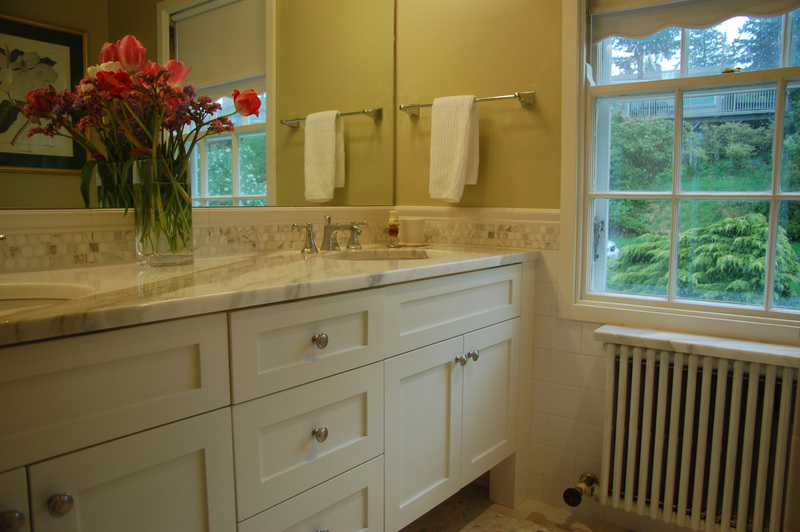 There are an unlimited number of ways your bathroom can be remodeled. I hadn’t thought too much about backsplashes until recently. They seem to be a small part of an overall kitchen remodel, and yet the more I thought about it, they are one of the small details that can add a great deal to the kitchen. Sometimes it’s the little things that set off a room as well designed and well built, with quality materials. The backsplash in one of our recent kitchen remodels struck me as visually appealing and complementing the rest of the kitchen with beautiful tile in an unusual arrangement. The backsplash in this kitchen is continued around the corner and behind the stove. Jeb/Design Build blog, out of California, has a nice collection of photos showing many of ways backsplashes can be designed and installed. Colors and patterns are endless, limited only by your imagination and your tastes! This is the bathroom I need! 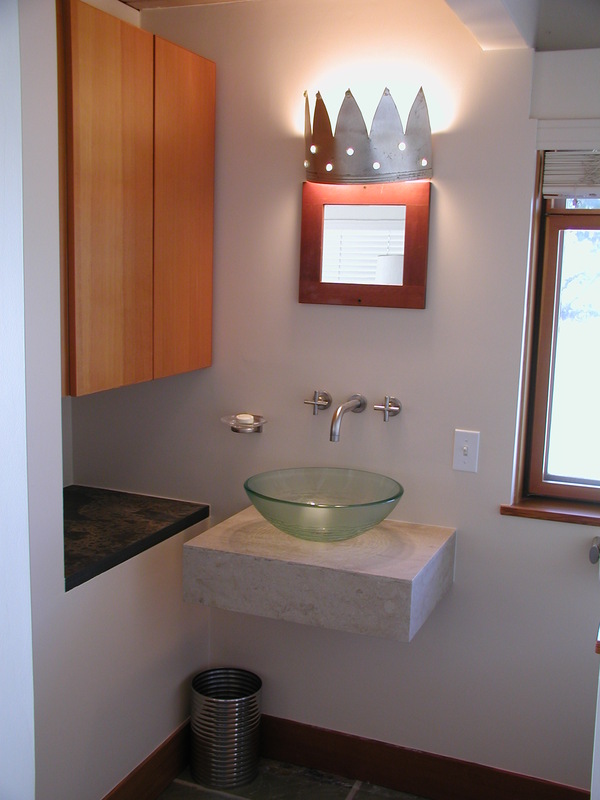 The Builder Online journal has a great article titled “Design Details: Showers and Tubs“. I love the photos in this spread. If you have ever thought about renovating your bathroom, you will get a major kick in the rear to jump start that reno for real, right now! There is an amazing variety of bathroom designs, something really for every taste. I often hear that expression, but rarely see it in one article. This is it! Go to the article and check out all the designs, then start planning your own!